The martian rovers Spirit and Opportunity continue to successfully weather a series of severe dust storms that threaten to cut power to their solar panels, but it's still a day-to-day battle for survival, scientists say. The pervasive dust in the martian atmosphere, as well as dust settling onto the machinery, impedes the ability of the rovers' solar panels to convert sunlight into enough electricity to supply the their needs. One critical need is to protect each rover’s “vital organs” of internal computer, electronics, heaters and batteries from becoming so cold that something might, quite literally, snap. Both robots are in position to pounce on exciting science targets: Spirit is ready to gather more evidence for long-past explosive volcanic activity in an area dubbed Home Plate; Opportunity is a mere 130 feet (40 meters) from the point where it will enter Victoria Crater. The twin rovers landed on the planet in January 2004. They have wheeled across Mars for far longer than their original 90-day warranties. There’s no doubt that the long-lived robots have a special connection to their operators. “There is a very strong attachment. It has been for many of us our everyday work for years. There’s a tremendous bond with them,” said John Callas, project manager for the Mars Exploration Rovers at NASA’s Jet Propulsion Laboratory (JPL) in Pasadena, California. “We’re just going to try to ride out this storm, he emphasized. Of the two rovers, Spirit, in the Columbia Hills of Gusev Crater is doing pretty well, said Steve Squyres, lead Mars Exploration Rover scientist from Cornell University in Ithaca, New York. Opportunity, located far away at Meridiani Planum, is currently suffering more than Spirit, said Jim Rice, a Mars Exploration Rover Project science team member at Arizona State University in Tempe. 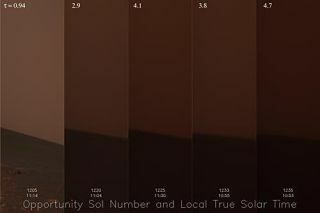 At Opportunity’s locale, atmospheric opacity is still very high and solar array power available to the robot remains low, between 130-140 watt hours. “The power levels have been lower there, and Opportunity is performing only bare-bones survival activities, communicating with us once every three sols,” Squyres observed. Squyres said that there are two concerns with Opportunity: One is that there’s need to keep the vehicle “power positive” -- to make sure that it generates more power than it consumes. The other is that the rover must keep its electronic innards warm enough. “The difficult thing about this is that the way you stay power positive is by not consuming energy, and the way you stay warm is by consuming energy. So it’s a matter of finding the right balance. We’re doing OK so far … but it’s day to day,” Squyres said. If things get really tough for Opportunity, the vehicle will take matters into its own hands, Squyres explained, invoking its onboard “fault protection” capabilities. “This hasn’t happened yet, but if it does, the vehicle will go into a safe mode where it doesn’t send us any data at all," Squyres said. "Instead, it will just sleep all day and all night, using what power it has to keep warm and only waking up for a short period each day to listen for commands from Earth. In a situation like that, we might decide to leave it alone for awhile until we got news from orbital images that the skies were beginning to clear." Jim Bell, the NASA Mars Exploration Rover Project's Panoramic Camera Payload Element Lead at Cornell University, called it as it is - a frustrating waiting game. Both rovers are ready to wheel onward and investigate new regions of their landing sites in detail. For Spirit, it is closer investigation of Home Plate, while Opportunity is ready to wheel itself into Victoria Crater. “The rovers themselves are fairly healthy. It’s the environment -- all the dust in the atmosphere -- that is the problem,” Bell said, but added that he remains upbeat. “I am optimistic that the rovers will ride out this storm and then get back ‘on the road’ to do great science,” he said. Steve Squyres shares Bell's optimism, and says he has good reason to. It turns out -- given all that dust flittering about in Mars’ atmosphere -- the temperatures don’t get nearly as cold at night. And that means that nighttime survival for a rover becomes much easier than it is when the skies are clear, Squyres advised. “So I think there’s a good chance we’re going to ride this out,” he predicted. Indeed, late last week, the news from Opportunity was good. Downlink data from the robot showed that the vehicle was in excellent health. And if the Mars machinery does conk out – does Squyres have any words in terms of Last Rites? SPACE.com Staff Writer Dave Mosher contributed to this story.